Light: Appreciating the luxuries that life has to offer. Being comfortable in your own skin. Enjoying your sexuality. Splurging on an expensive personal item. Embracing the fact that everyone has a darker side. Dealing with unhealthy impulses in healthy ways. Shadow: Putting excessive emphasis on appearances. Always wanting more. Valuing possessions more than people or relationships. Allowing base instincts to govern your life. Being selfish. Attributing your own dark impulses to outside forces or other people. Mythical/Spiritual: The Biblical Satan, certainly. Fallen angels, including Lucifer. Bacchus and Pan. Tempters and serpents of every stripe. Story: The main character comes face to face with his or her adversary. Alternatively, the main character realizes that his or her own perceptions or actions are the cause of the story’s primary problem. Relationships. Avoid the temptation to blame everything on everyone else; own your own contribution to the relationship’s success or failure. Doing what feels good is not always the best strategy. Take care that sexual attraction plays a healthy role; resist the tendency to be dominated by cravings. Spirituality. Many traditions position the body as bad or evil, something unclean. In your own spiritual practice, consider the wisdom of relishing the body and its spectrum of sensations. You can honor the pleasures of the body without being enslaved by them. Personal Growth. Be honest: what habit or attitude holds you back most? You might find that the qualities you most detest in others are, in fact, reflections of your darkest self. Rather than be chained to old attitudes or habits, embrace your shortcomings and strive to make more conscious choices. Fortune Telling. Adultery and unfaithfulness. A string of extremely bad luck is coming your way. Beware evil influences and wolves in sheep’s clothing. The beast. The Marseilles Devil incorporates bat wings and sexual features. The RWS Devil, influenced by Pan and associations with Capricorn, is more bestial and fearsome. The Gilded Tarot emphasizes the attractiveness of the Devil; the Bright Idea Deck suggests that the Shadow is, in fact, within. Which plays the greatest role in your challenge: fear, attraction, or denial? Prisoners and chains. The Devil is accompanied by fauns — mythical half-goats whose horns and tails emphasize their bestial nature. Their fascination with the material prevents them from stepping away from the loose chains around their necks. Might someone in your situation need to escape the influence of his or her basest instincts? Flames. Flames appear on the tip of the male faun’s tail in the RWS. What all-consuming obsession or passion plays a role in your situation? The pentagram. Upright, the pentagram is associated with the five points of the human body. Inverted, it suggests the head (the intellect) has been conquered by desire. In your situation, are you being led by your conscience or your cravings? The hermaphrodite. 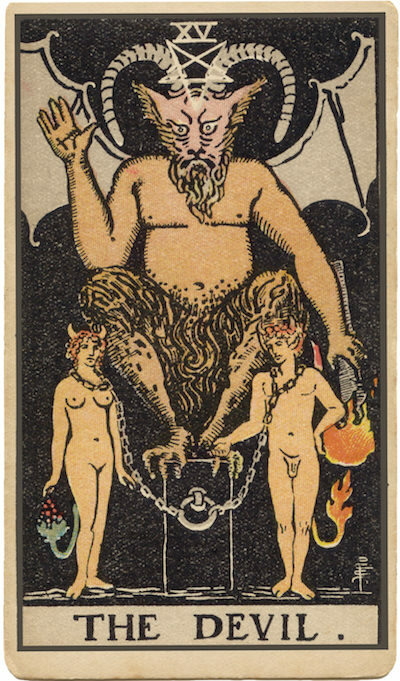 The Devil is often drawn as a hermaphrodite—a dark parody of the unity associated with enlightenment and divinity. How might false unity or misrepresented loyalty play a role in your situation? What enslaves me? How can I set myself free? How can I reevaluate the importance I assign to material things? To what extent do my cravings define me?